Well, awesome people, the show is over. The winner has been picked and…it’s not who I predicted it would be, which is a bummer. 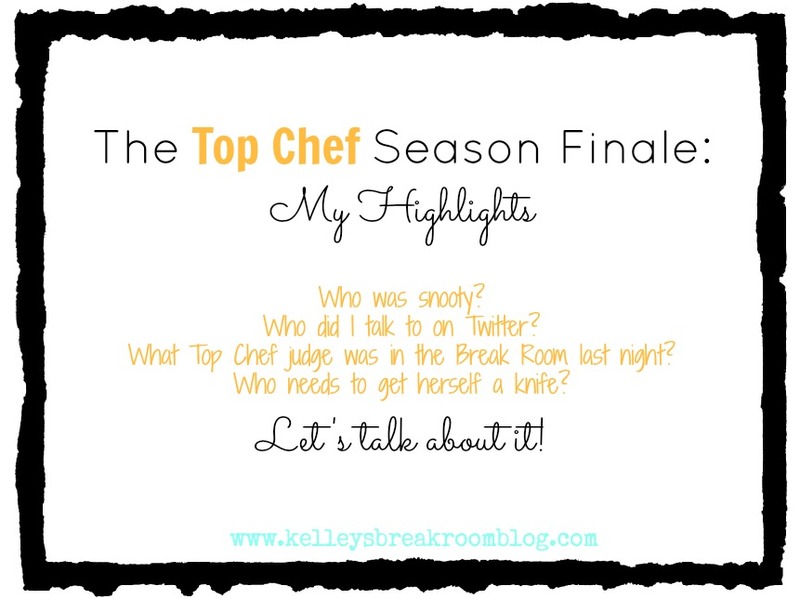 By now, surely you know who has been crowned Top Chef, right? This is not a shocker. I mean, when Kristen was asked to pack her bags, she had won a ton of challenges. She then went on to Last Chance Kitchen and kicked some major chef derrieres there (you know chefs and their love of French words). Also, it just seems that the chefs were leaning toward Kristen when I am betting they liked Brooke’s food better. The thing is…Kristen was battling against Brooke and I wanted Brooke to win. Besides the fact that she is an extremely talented chef and makes the kind of food that I would actually want to eat, she is just a great, fun and inspiring person to watch. I loved her tribute to her son, James, during the finale. She said that she wanted to make him proud of her and demonstrate to him that he could battle any fears he might face in his life and overcome them. She truly has a phobia of heights, boats and helicopters and was on all three at some point during the show. But, it’s not as if I am not inspired by Kristen either. It was very touching to hear her talk about the fact that she loves and adores her family but…wants to see people that look like her. Kristen was adopted from Korea as a little girl by some white folk and brought to the United States. She plans on returning to Korea very soon and exploring the place of her birth. She’ll certainly have the money to do it! She won $125,000 furnished by Healthy Choice which is super awesome, of course. She also will have a feature in Food & Wine Magazine and will be showcased at the Food & Wine event in Aspen in the near future. Now, let’s get on to the highlights of the show in bullet form, ‘mmmkay? THE SMALL PRINT: Did you see this flash up at the end of the show “Winning and elimination decisions were made by the judges in consultation with the producers. Some elimination decisions were discussed with Bravo”. People? Read that again. For real? This means that perhaps the judges were not just going by taste alone. They made their decisions so fast. It wasn’t like they deliberated at all. Maybe one was influenced by the other. To me, this means that they had slated Kristen as the winner before the show even started. That is why they could so quickly and confidently say “Kristen” when asked for their votes. I really believe that. Do you? THE STADIUM: Brooke commented that she wasn’t expecting a stadium when she entered the room with the live audience for the finale. That would definitely be intimidating! There were tons of people in there for the three hour contest. Did you see the poor people who were in the very back just sitting in chairs? Their mouths were watering for some of that bone marrow, I’m sure! I wonder if they at least had one of those wooden peg games you see on the tables of Cracker Barrel. THE TEAMS: Brooke’s team consisted of Stefan, CJ and Kuniko and Kristen’s team consisted of Sheldon, Lizzie and Josh. Brooke said she chose Stefan because he’s super fast, CJ because has a “beautiful palate” (but he made those dingdang pig ears too crispy!) and Kuniko for her precision. It just seems that Kristen’s team may have been a little stronger since those were the three that lasted the longest on the show behind Brooke? Sheldon could have easily been in the top two. What do you think about the teams? When Kristen walked up with her long bag that I think contained knives, my husband asked, “What if she accidentally brought her billiards bag? The show would be over pretty quick.” The bag looked like a bag that contained pool sticks. Padma: I don’t know if I could contain myself if I was Brooke and heard Padma tell me, “You need to catch up” after the first round. She knows she needs to catch up, Padma! It’s like a teacher telling someone who just made a bad grade on a test, “You need to study more next time.” So annoying. Maybe I get annoyed too easily. Padma again: During one of the courses, Padma gave her vote to Kristen by saying, “Kristen served the better dish.” It was very…exact. It was like she was the ultimate judge or something. I don’t know. Maybe I need to take some Midol. Kristen: She may not have meant this in a condescending way, but when Kristen told Brooke “Save one for me” when they were both making the scallops, it just sounded a little snooty-ish. They both had to make a course with scallops and one with snapper. Kristen said that Brooke tried to dress up her scallops too much (she may have been talking about the snapper). What do you think? Maybe I’m just paranoid. Gail: She keeps them coming. She asked Brooke, “Were you concerned at all that you cooked the scallops too early?” Uh, no, Gail. Brooke wanted to cook them just how she cooked them. She’s been planning for this night for a long time. Duh. Gail again: She criticized Kristen for serving the leeks all long and stringy because it made it hard to eat. I loved that Hugh said that he was “good with the knife”, so didn’t mind the stringy leeks. Goodness gracious, Gail. Just use the dadgum knife. It really is hard to believe that it is over. I truly had LOTS of fun blogging about it and discussing the show with you all. I have had lots of fun on Twitter, too. That is for sure! Yesterday, I wrote a post within about 30 minutes called “The Top Chef Drinking Game” and started sending it out to current chefs on the show and previous ones, too. It was one of those “Would you mind giving this a RT?” tweets, which I know is annoying. I’m so glad I went in that direction, though, because it got shared A LOT. Maybe you Top Chef super fans will recognize some of these people? These tweets make me want to go back and watch all of the seasons I missed. 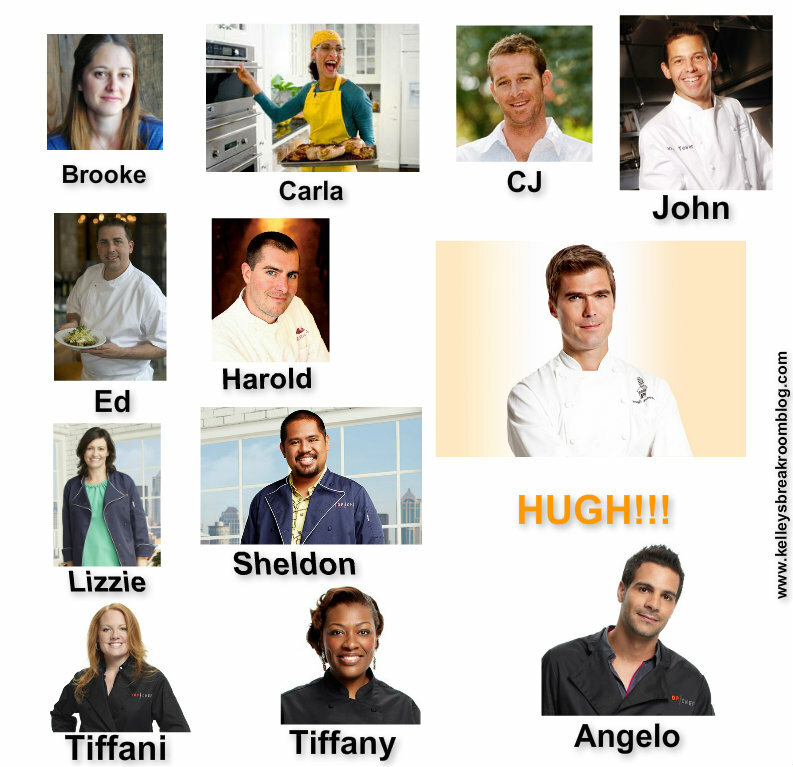 Here were the chefs that retweeted my silly post, which left me all chef-struck. ANYWAY, thanks SO MUCH for all of your support this season! Thank you for stopping by here and throwing in your two cents. Or five. Some of you even threw in some half dollars. If you still want to talk about Top Chef some more, you might want to check out these recent posts of mine below. You know I’m always ready to chat it up about those fancy chefs! Emeril Said He Loved Me On National TV!!! Oh! And I haven’t forgotten about the contest I held a few weeks ago where I had you guess who would win Top Chef. The first name picked that guessed the right answer would be given $100. I am going to pick the name today! Check my Facebook page here to see if that cash is coming your way.